Karen once said that she wished Egil had a blog. He’s been thinking about it. 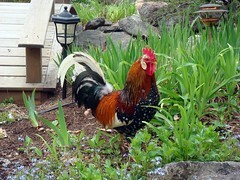 He’s the lone rooster now, far away from his homeland in Iceland, a really, really rare breed. He’s servicing too many girls, to be honest, and has admitted we need another rooster. He and I are evaluating the current crop of cockerels. One or maybe two of them don’t have a visit to freezer camp coming up this fall like the rest of them do. He’s a really busy boy, who starts his day around 4:15 each morning. He’s got lots of girls and boys to get into the coop every night around dusk. He’s got to defend all these dependents against the wildlife. It’s been a horrible year for predators this year. And now the other gangs of birds are starting to pick on him, too. Boo. He’s a man of few words, though, and a blog is a bit much for such a busy rooster. He and I share a goal of soon having more Icelandic chickens than Iceland, even if we are working from a very limited gene pool. He’s decided to tweet, instead.